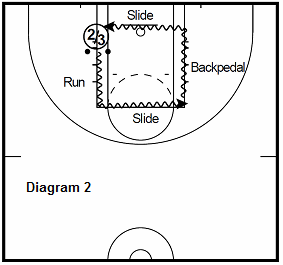 Coach Springer presents these workout drills to help make you a better player. Diagram 1. This is a 10-move combo that will build your ability to make every move. Work on learning the sequence and then move quickly through it. Diagram 2. 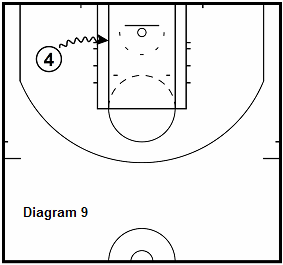 2/3 dribbles 2-balls around the paint. Go four times in each direction. Your focus is on ball and body control through different plane movements. Diagram 3. 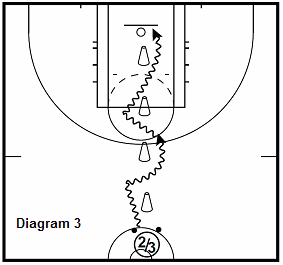 2/3 weaves with 2-ball dribbling through the cone lines. Tuck the ball at end of the line and finish with a layup. Focus on dribbling with your hips and the ball low. Also make strong steps through cones. Make 15. Diagram 4. 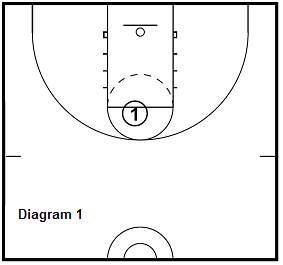 Players start with ten 2-ball pounds then give one ball to the coach. From there they weave between the cones with a change of directions. 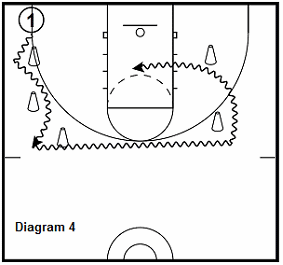 When they get to the last cone they use a bounce out dribble to the opposite side. The player then makes a double change of direction at the first cone and attacks the second cone. They make another move on the second cone to finish on the mid line. Diagram 6. 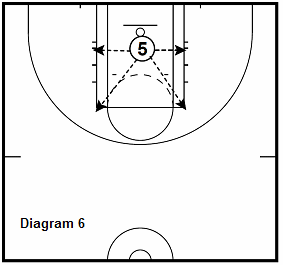 5 makes self pass to both blocks and elbows (rotating after each shot clockwise). Diagram 7. 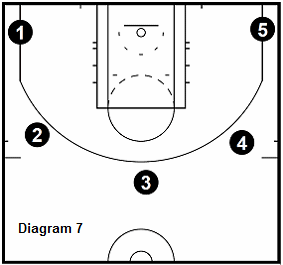 Make seven 3-pointers at all 5 spots under 3 minutes. Diagram 8. 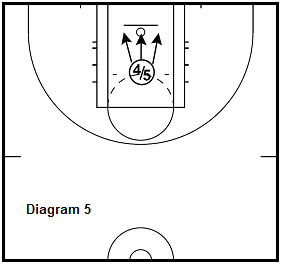 Take 2 shots each in all 5 spots: Catch and shoot, 1 dribble jump shot to left and 1 dribble jump shot to right. Goal is to make 30 total. 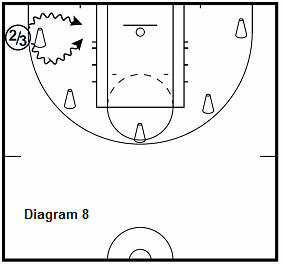 Diagram 9. Each player catches and attacks the baseline for the score.